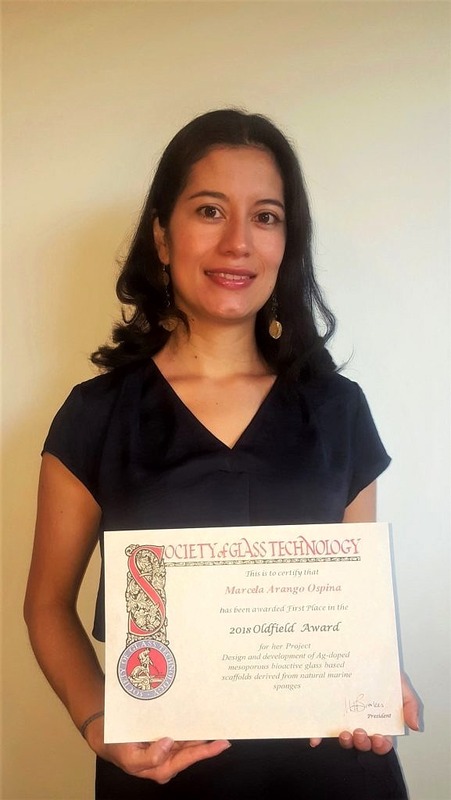 Ms Marcela Arango Ospina, who graduated from the FAU Elite Master program Advanced Materials and Processes (MAP), has won the Society of Glass Technology (UK) Oldfield Award 2018 (1st prize) for her Master thesis: „Design and development of Ag-doped mesoporous bioactive glass based scaffolds derived from natural marine sponges“, carried out at the Institute of Biomaterials, under supervision of Prof. Aldo R. Boccaccini. The award is open to students worldwide, who have carried a final research project related to any experimental, theoretical, or practical work in the field of amorphous solids, glasses, glass-ceramics or sol-gel materials, glass history and archaeology or glass arts, technology or design. The award consists of a cash prize, one year’s membership to the Society, and the invitation to present the results at the Annual Conference of the Society, held in Cambridge, UK. Marcela is currently a doctoral candidate in the Institute of Biomaterials working on novel glass compositions for bioactive scaffolds under supervision of Prof. Aldo R. Boccaccini. We congratulate Marcela on this wonderful achievement!